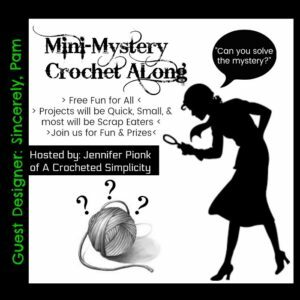 Hello & Welcome to our 6th Mini-Mystery Crochet Along! If you haven’t already done so, please make sure to sign-up for our newsletter so that you don’t miss out on future mini-mystery crochet alongs! I always send out a newsletter a couple days before the next MMCAL begins so you have time to choose yarn from your stash and get everything ready. If you’re new to our Mini-Mystery Crochet Alongs, please read our Information Guide in this blog post HERE so you know how to join along! I’m so excited to announce that we have another guest designer joining us for this MMCAL, Pam from Sincerely, Pam!!! Pam has over 150 designs in her Ravelry shop (both paid & free). Designs ranging from home decor to garments & accessories for both kids and adults, you’re sure to find something that catches your eye! 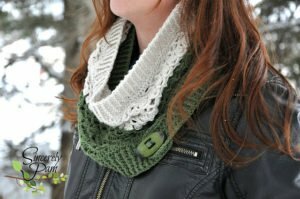 Here are 2 of my favorites: Kate Cowl (premium crochet pattern) and Charlottetown Cowl (free crochet pattern). This MMCAL will be posted in 3 segments. When it is time for Segments 1 – 3 to be posted, check the Facebook or Ravelry groups for the links, or simply head on over to Sincerely, Pam’s Blog. Material List & Schedule Announcement: SCROLL DOWN – Right here in this post! Segment 1: Friday, October 19, 2018 at 5am CST. Segment 2: Saturday, October 20, 2018 at 5am CST. Segment 3: Sunday, October 21, 2018 at 5am CST. Monday, October 22, 2018: MMCAL Closes & winners will be drawn. Winners will be announced around noon CST. The design from our Mini-Mystery Crochet Along #6 was a Tea Towel! 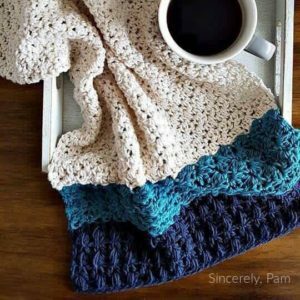 Click the photo below to be take to the Free Crochet Pattern on Sincerely, Pam’s blog! (1) Winner will receive a pattern of choice from both A Crocheted Simplicity & Sincerely, Pam AND a yarn prize from A Crocheted Simplicity. (3) Winners will each receive a pattern of choice from both A Crocheted Simplicity & Sincerly, Pam. Each photo you post will receive a number throughout the MMCAL. Please keep track of your numbers as we use these numbers to draw winners! 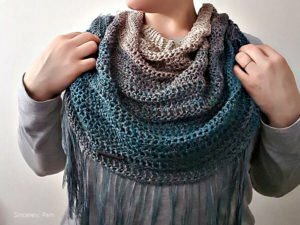 « Touch of Alpaca – Yarn Giveaway!